Having taken a five point lead following the conclusion of the Italian Grand Prix, I would next face another one of my bogey tracks – Singapore. 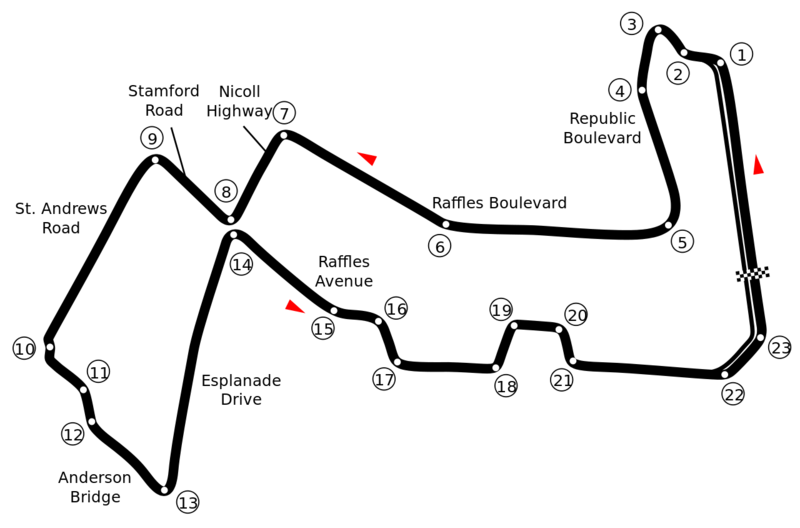 Singapore is F1’s only full night race, held on a bumpy street circuit and in sweltering, humid conditions, even despite the time of day. In real F1, this is a test like no other; drivers sweat buckets and endure the vibrations down their backs for two hours (Singapore runs to the maximum length permitted for any race), and have to concentrate from start to finish with barriers waiting to collect them in the event of a mistake. In 2009 turn 10 had already established itself as a horribly bumpy chicane that would, if not taken right, bounce a car right into a barrier. Recent modifications have reduced the bump considerably, but for my race experience I had to face it. The first couple of practice laps saw me hesitate a little here and there, not being certain of braking zones and racing lines. With a little practice though, I was more confident going into qualifying than I usually am at Singapore. I managed pole once again, but spent the first couple of laps behind Vettel and Button, after a slow start. It didn’t take me long to get back past them both, and I was able to eke out a good enough lead so that, by the time the first pit stops were over, I was only a few seconds behind Vettel. I made short work of him and continued to race at a competitive pace. After the second set of stops I was briefly behind a slow Button, but fresh tyres saw me make short work of him, and by the time of the third and final stops, I was able to emerge still in the lead. It appeared that I was on course for a seventh win, and I was continuing to extend my lead. All looked good, until lap 51 of 61. That was when my engine failed. Needless to say, I was gobsmacked. I wasn’t even annoyed, I was stunned! My first retirement of the season came just as victory seemed guaranteed (and the win would have moved me 8 or 9 points ahead of Button with just three races left). Button’s fourth place means he now ties me on 94 points, with just three races left!